@eatruneat and I were feeling good, but in need of a snack after doing a wine tasting at A Litteri and scoring several bottles - seriously, if you like Italian wine, you need to check out A Litteri. They won an award as the best selection of Italian wine outside of Italy a few years ago. Anyway, we sat down at the bar and were warmly greeted by co-owner Antonio. I ordered a glass of wine and @eatruneat ordered the 'Stellina Sprotz'. After trying her drink I immediately regretted ordering wine. Made with DC distiller Don Ciccio & Figli's Amborsia liqueur and a few other ingredients, it was a light, slightly sour orange delight. I looked down the bar and realized that everyone else had one except me. We ordered the Cotto & Funghi pizza and were a little surprised when it came out uncut. Two seconds later a server dropped off pizza cutter, which didn't totally solve the issue. The tray the pizza is served on has a bit of a lip, which makes cutting the crust a challenge. Once cut though, the pie was delicious. The sauce tasted close to Marcella Hazan's tomato sauce with a hint of sweetness and velvety texture and the toppings tasted very authentic. Unfortunately we were time constrained and that was all we were able to try, but will be back to try more and this time I'll get myself a Stellina Sprotz. So that was just another seared mushroom, eh; or was that a stray piece of porchetta? 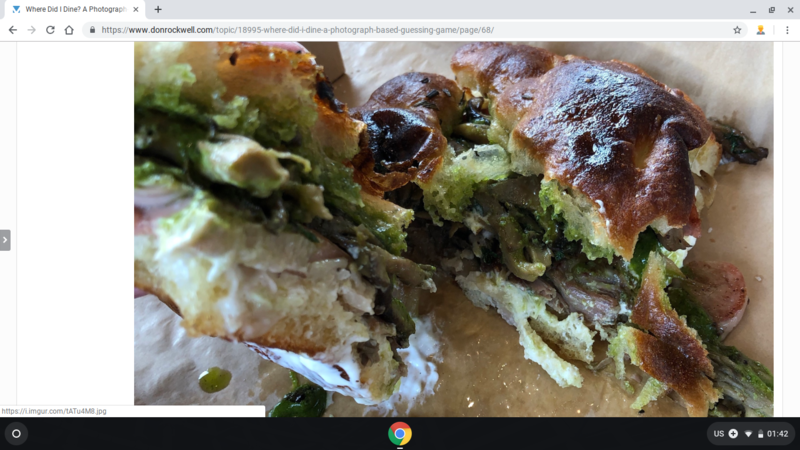 And that vertically fibrous, 1/2-cm-thick, gray thing on the bottom-left, immediately on top of the bread, is a piece of porchetta? Yes, what you saw as a scallop is a mushroom and the fibrous piece is porchetta. We’ve been twice now, once for lunch the day they opened, and everything has been good but perhaps not great. Certainly good enough to warrant return visits, though. They have a fry basket which includes fried shrimp, calamari, and potato chips which was good but maybe could have used one twist up on the crispiness dial. Pizzas were delicious and everyone was nice and enthusiastic about the new venture.